Trim wooden ends of asparagus and cut into pieces at a light angle (approx. 1 cm pieces). Hull strawberries and quarter. Heat up some olive oil in large frying pan and fry asparagus pieces at moderate heat for approx. 8 – 10 min. until tender. Season with salt and pepper. Roughly chop pistachios. For the vinaigrette, mix olive oil, balsamic vinegar, and salt and pepper. 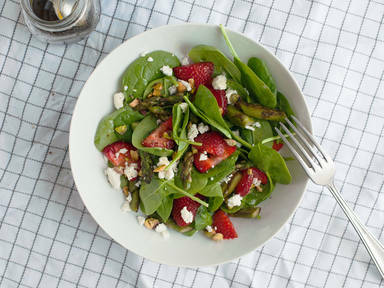 Combine baby spinach, fried asparagus, strawberries, and crumbled feta in a bowl. Dress with vinaigrette and sprinkle with pistachios to serve.